The red-hot footwear and apparel maker is close to launching its second 3D-printed sneaker -- and it probably won't be cheap. Everyone thought that Under Armour's (UA - Get Report) first 3D-printed sneaker released in March was a glorified marketing tool. Guess again, as the red-hot footwear and apparel maker is about to prove it could be a potentially lucrative business. The company will launch its second 3D-printed sneaker -- likely in the training category -- by the end of the summer, a source close to the matter confirmed to TheStreet. That release may be followed by several others before the end of the year. "What you will see [this year] is an increase in the number of units, colors and styles in the Architect [Under Armour's 3D printed shoe line] platform this year," Under Armour president of product and innovation Kevin Haley told TheStreet at the opening Tuesday of UA Lighthouse, the company's new center for manufacturing and design innovation in its Baltimore, Md. backyard. Haley didn't deny that at some point in the future a Steph Curry basketball shoe -- one of UA's hottest endorsements -- could be made using 3D-printing technology. For now, however, the focus remains on training sneakers. Several Under Armour sneakers that were made using 3D printers. "The training shoe [we created] is phenomenally stable but also cushioned, which is often hard to achieve at the same time," said Haley. "The [3D-printed] lattice structure is allowing us to create the holy grail of a super stable but also cushioned [sneaker] -- I think it has legs in lots of different end uses." Back in March, Under Armour unveiled a limited-edition 3D-printed training shoe called UA Architechs. It featured a 3D-printed midsole and upper design that enhances the fit for consumers and is more lightweight. The training shoe came together after a a two-year research and development process that involved the study of geometric shapes and structures to come up with the midsole design, according to Under Armour. Only 96 pairs of the UA Architechs were made. The price? A cool $300, which was light years removed from the mostly $85 running sneakers Under Armour sold when it entered the footwear space back in 2008. But consumers apparently weren't turned off by the price for a product that is lighter and fits better. Said Haley, "I think the original shoe launched in March sold out in 18 minutes, so we think the demand is there despite the $300 price point." 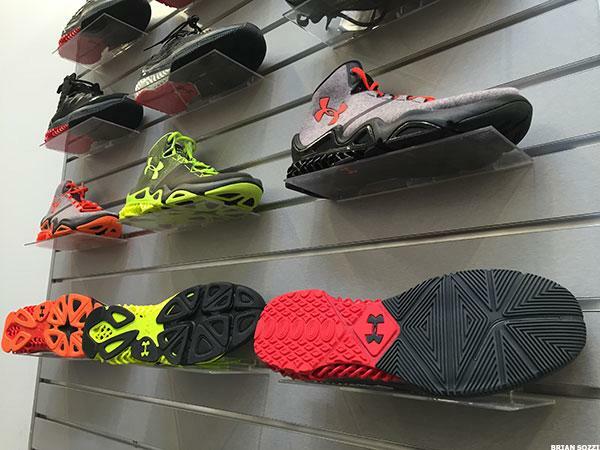 Scientists at Under Armour's new manufacturing plant show off some 3D printing technology. Under Armour's new push into high-priced 3D printed sneakers -- at a time when rivals Nike (NKE - Get Report) and Adidas (ADS - Get Report) have no competing versions on the market-- could provide a nice boost to an already hot footwear business. Under Armour's footwear sales in the first quarter skyrocketed 64% year over year to $264 million. For 2015, footwear sales increased 57% to $678 million. Footwear now makes up about 17% of Under Armour's business. "3D printing is the future -- imagine walking into a store and 3D printing your own footwear from your favorite brand," pointed out sneaker expert Clyde Edwards. 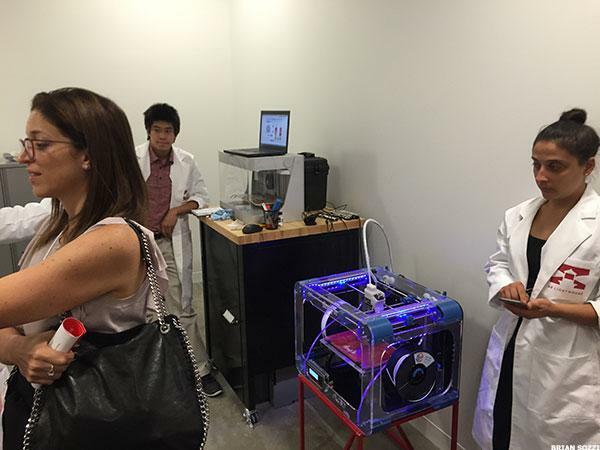 "3D printing is not a gimmick," remarked one of the scientists guiding a tour of UA Lighthouse. He could well be right.